Deer River glistens behind us. My idea of a perfect vacation looks an awful lot like work to many, yet I know I’m not all that different from you. Take cowboys, for example. Do you ever notice that there’s never a shortage of good hands at a traditional branding? Good horses, some in training, are lined up around the outside of the branding pen to watch the action. Kids, in their own pens, mimic the action. And somewhere, someone is cooking. 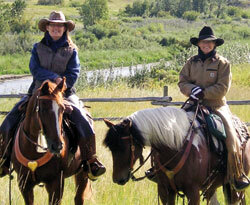 Ranchers tend to brand on the same weekend every year, weather permitting. In a long-established ranching community, everyone knows who brands when. For about a month or more, there is steady traffic from one ranch to the next as they give each other a helping hand to get the job done. Do other professions work that way? Do accountants all get together on a weekend, pull their desks in a circle, and do each other’s taxes? I don’t know. There’s just something about good horses, good hands and good food that turn a job into a vacation. Our Living Legend is the wonderful Frances Riviere, who tends to winter in Pincher Creek as her ranch gets too snowed in for easy travel. In one of our many conversations, we discussed early photos from her collection. When I wondered aloud if any might be available to publish, Frances assured me that if she “didn’t have them at her place in Pincher, she would gladly snowshoe into her ranch to get them” — an eightmile trip, one way. Did I mention Frances is in her 70s? This issue we also serve up fashion for men and women. Just because you’re in the barn doesn’t mean you can’t look nice. With that in mind, we’re featuring fashion trends that will shine you up with styles for the barn, from lookin’ good everyday duds to duded-up black-tie affairs. This is also our wildly popular annual Vacation Guide — and we’re bringing some new sights, such as the Nk’Mip Cultural Centre (pronounced IN-ka-meep) in southern B.C., and our picks for the Top Ten Fairs & Exhibitions for western family fun. here in Canadian Cowboy Country.